These Wireless Cat Ear Unlimited Edition Headphones are the “cat’s meow” when it comes to Bluetooth sound technology. The Cat’s Ear design not only make a visual statement, but you can switch from headphone listening to live broadcast via the built-in speakers. The package illustration, display outline and Cat’s Ear Speaker exhibit show the “look” of the tech. Consider from various distances in the gallery of images. 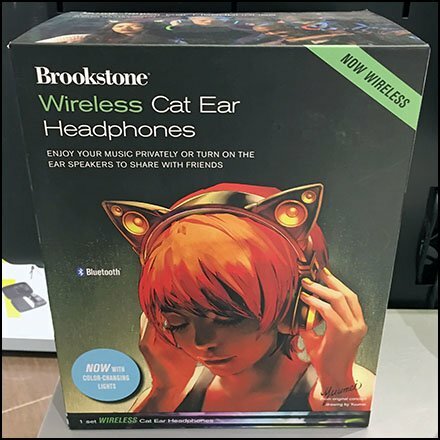 These Wireless Cat Ear Unlimited Edition Headphones and point-of-purchase display seen at Brookstone, The Short Hills Mall, Chatham NJ.